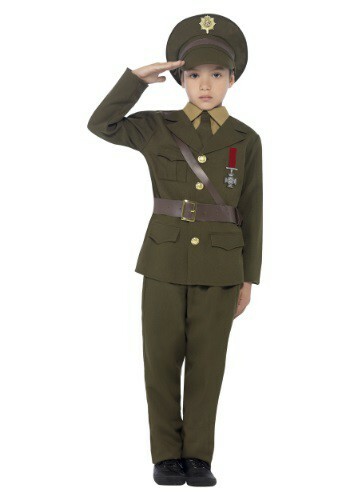 With this costume, your child will be ready to suit up and lead an army. He must be one sharp cookie, because when he enlisted he went straight to the rank of officer! And even if his army is a little lacking in numbers, there's no need to worry about whether or not he's going to have a good time. If your child is ready to patrol the streets of their neighborhood in search of candy this Halloween, then an army costume is just what they need to make their Halloween one to remember. Not only does this military costume give them a look of authority, but the fact that they look as though they are an officer makes them even more respected. This kid’s Army costume is sure to give him the authoritative look that commands respect, even if he doesn't have the soldiers to back him up quite yet. Get him ready for command with this look! The included jacket fastens with gold-tone buttons at front center and has an attached belt with a metal buckle. The matching pants have an elastic waistband for a comfortable fit they can wear while on patrol in the neighborhood on Halloween. The shirt front fastens with Velcro at the back of the neck and makes for a more complete look. Top it off with the traditional military style hat that has an elastic band at the back for a snug fit. The embroidered emblem on the front of the hat will let others know you mean business when you knock on their door asking for candy!